Decatur Public Library's history includes many great people who made the library the communal asset that it is today. In 1867 a small group of women called the Ladies Library Association inspired the birth of the Decatur Free Public Library in 1875. The first Library board contained the names of many men who still have standing legacies in Decatur, including William A. Barnes. However, a provision in the board’s governing laws dictated that a third of the board be comprised of women. 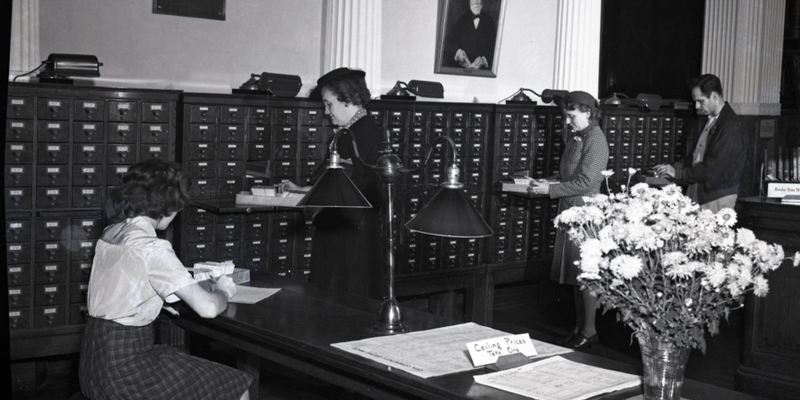 Women have inspired the growth of the Library throughout its existence. One woman who made great contributions was Alice Glore Evans. Mrs. Evans’ husband, Richard L. Evans, accepted the post of the first city librarian of the Decatur Public Library in 1875. In his first written report to the board, Mr. Evans noted, “Indeed, since the first week of the opening, I have been obliged to have my wife’s assistance every evening.” Working beside her husband day and evening, Mrs. Evans was an invaluable asset to the Library. Upon her husband’s death in 1881, Mrs. Evans was named his successor. For more than 50 years, Mrs. Evans served the Decatur Public Library. Under her administration, the circulation of the Library continued to increase, outreach services at local schools were developed, and the Alice G. Evans branch library was constructed. Her friends and community members remember her as being cheerful, kind, and courteous. Many shared fond memories upon her death in 1926. One particular note captured the essence of who Mrs. Evans was and what she meant to the Library. In honor of Mrs. Evans’ contributions to the Library, her portrait is prominently displayed on the wall outside the Library’s administrative offices on the second floor. As the library grew, the need for a new building arose and by the turn of the 20th century, plans were in place. The Decatur Public Library Building, located at 457 N. Main, was built at a cost of $65,000. A grant from Andrew Carnegie paid for most of it. The cornerstone was laid on June 16, 1902, and the building was opened to the public on July 1, 1903. By 1970, the library was in need of a larger facility and obtained the building on 247 E. North Street which had recently been vacated by Sears. In 1996, when Sears announced its plans to move to the mall in Forsyth, the library investigated the Sears building as a potential new site for the main library. Located on North Franklin Street, across from Central Park, the area was highly visible, accessible, and offered ample on-site parking. On May 27, 1997, the library purchased the property for $2.4 million. On October 30, 1997, a contract was signed with Phillips Swager Associates of Naperville, Illinois to provide architectural services for the renovation of the Sears building into the new main library facility. Funding for this $8.2 million project came from a variety of sources. The Decatur City Council on February 9, 1998, approved the authorization of $5.2 million in bonds for the project which was to be paid back from sales tax revenue. The library obtained a $250,000 Live and Learn Construction grant from the Illinois Secretary of State’s office. During 1997 and 1998, the Decatur Public Library Foundation conducted a successful $1.6 million capital fund drive. The remaining funds came from funds that the library had set aside for the project. A ribbon-cutting ceremony was held on October 1, 1998, to mark the beginning of the project. Mid-States General and Mechanical Contracting Corporation of Decatur was the general contractor. The project included gutting the interior of the main Sears building and removing all asbestos from the facility. The 104,000 square feet on two levels of the building were renovated for library use. This left 35,000 square feet of the upper level available for the library to lease to prospective tenants. On September 7, 1999, the library opened its new state-of-the-art facility at 130 North Franklin Street. Designed with spacious interiors and a contemporary décor, the library now includes a 180-seat auditorium, as well as a 25-seat conference room, both of which are available for community use. The Library serves a population of over 75,000 residents in the City of Decatur and the Macon County area, which encompasses an area of approximately 342 square miles. The Decatur Public Library is currently the largest public library in Share Holdings and Resources Easily (SHARE), a member of the Illinois Heartland Library System (IHLS). As a member of SHARE, the number of items that can be accessed by DPL patrons through intra-library loan are increased to approximately 11 million items from the 400 plus member libraries. The services offered by DPL are valued and utilized by the community. The library’s over 400,000 items, including books, audio-visual materials, periodicals, downloadable materials, and government documents, are arranged for maximum user benefit. The library catalog and many library resources can be accessed electronically throughout the library facility and via the internet. Indirect lighting provides an even lighting source throughout the lower level. The open, entry level, public service area is occupied by Adult and Young Adult Services, and a large local history room. The entire adult collection is located throughout the entry level. This level offers convenient, comfortable seating for 250 users. Public access Internet computers, as well as the Check Out Desk, are also located on the entry level. Parents and children who take the central staircase up to the 16,000 square foot children's area are greeted by a large wall mural. The children’s area offers an extensive collection of books and audiovisual materials, plus seating for over 100 individuals. A children’s auditorium, enclosed toddler play area, and puppet theatre complement the bright and colorful area overlooking Central Park. The 94 feet of gallery space on the upper level provide an excellent location for art and cultural displays in a variety of formats. In addition, the library’s computer lab is located on this floor near the administration offices. The library offers a wide variety of free computer classes to the public.